Miranchuk twins play football for Russia – Royal Times of Nigeria. Opponents of Russia’s national side can be forgiven for confusion as they face two identical players: twin brothers Anton and Alexei Miranchuk. 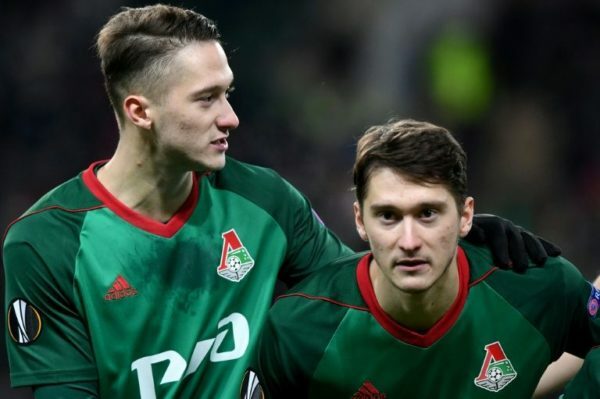 The 22-year-old Miranchuk siblings appeared together in the national squad for the first time last month after manager Stanislav Cherchesov rewarded their solid performances for Russian league leaders Lokomotiv Moscow. “We gave the new players a chance to show their worth in matches with teams that have already qualified for the 2018 World Cup finals,” Cherchesov told journalists after friendlies with South Korea and Iran. “(Mario) Fernandes, (Konstantin) Rausch and the Miranchuk twins looked impressive with their club sides this season and we needed to test them in the national squad. The country’s football chief Vitaly Mutko hailed the brothers from the southern Krasnodar region as part of a new generation of dedicated players, a much welcome boost after a dreadful Euro 2016 campaign. The twins meanwhile said their invitation to the national side had done wonders for their confidence. “It was incredibly motivating for us when we got the call up to the national squad,” Anton Miranchuk, who made his senior Russia debut in October’s 4-2 win over South Korea, told AFP. “Of course it’s a great responsibility,” his brother Alexei, who earned the first of his 12 international caps in 2015, added. The players’ mother Yelena Miranchuk said the family traces its origins back to the Cossacks, independent horsemen forces who guarded Tsarist Russia’s borders. She told Russian television she believes this gave her sons their active and uncompromising nature. The brothers started out training with the Olympus club of their native town of Slavyansk-on-Kuban in their home region. After a couple of years, Spartak Moscow invited the boys to join their football academy. They came to Moscow with their mother, a trained teacher who got a job at their school’s boarding house. “It was non-negotiable that our mum came with us,” Anton said. “She’s the head of our family — she has always been with us, she has watched and supported us the whole time,” Alexei added. After the Miranchuk brothers turned 16, Spartak released them for not being physically strong enough, forcing them to join Lokomotiv’s academy. Their natural talent soon shone through and they became integral members of Lokomotiv’s youth squad, winning three consecutive Russian titles. Alexei then made his debut in the Russian Premier League in 2013 but Anton was made to wait before getting his chance. Anton was sent on loan to Estonian high-flyers Levadia Tallinn for the 2016 campaign, during which he scored 15 goals in 33 matches. That form abroad earned him a brief cameo alongside his brother for Lokomotiv at the end of the last season, before thrusting him into a regular role this term. But the separation was hard, Anton admitted. “We’ve been together since we were born. I feel a constant spiritual connection with my brother and I feel I miss him after just a couple of days apart. His brother Alexei naturally agreed. “For me it was really hard to play and to progress without my brother,” he added. “But now I feel that this parting was for the best.